Why has a Greens Population/Sustainability Working Group Member been vilified as racist and sexist and harassed with threats of expulsion for sticking up for our wildlife against needless rapid population growth? Read what Geoff Dowsett wrote and the response he got from candidate Tamara Ryan (included in the article). What do you think of this response? I don't care about your vote, but I do care fiercely about advocating for women's autonomy over their bodies, rejecting racism and opening borders. Capitalist structures that promote continuous growth and waste by corporations and governments are responsible for stifling efforts on climate change, not people seeking a place and way to live. Is Open Borders official Greens policy now? Ms Ryan's unpleasant response to Mr Dowsett seems sexist itself, with an unfounded slur of 'racism', and an implied threat about his membership of The Greens being 'collectively reconsidered'. This is not the only time I have heard of Greens members in population working groups being intimidated, for I have suffered by it personally. As a committee member of Prosper Australia, around the time of the formation of its ‘green’ Earthsharing brand, I personally experienced, with another committee member, similar treatment from a cluster of new members, vocally hostile about our affiliation with Sustainable Population Australia (SPA). This hostility manifested as a very threatening warning from one of them following a small rally of oddly assorted pro- lifers and claimants to be refugee advocates outside a perfectly innocent but important public meeting on democracy in Australia which we as members of SPA were holding at the premises of Prosper with the blessing of the Prosper committee. As it transpired, our treatment was part of a hostile takeover by Socialist Alliance members of the comparatively wealthy NGO. We had to leave. Some of these people later have thrown their weight about in the Greens on population issues. I later joined my local Greens, far away from Prosper, but at the mention of population, (myself and) another member (an immigrant from Cairo whom I had only met in that branch) and I were sent to Coventry by a then recent blow-in from the Labour Party, who took over the management of that branch of the Greens email list. No-one now would dare discuss the obvious problem of high immigration, with its huge contribution to high population growth, and the impact on wildlife and the green wedges of expanding suburbs. "This is my recollection of working with a team within the Greens on revising the Population Policy. At that time many of the Greens’ polices were being reviewed by working groups. About eight of us met several times in the city after work to focus on the policy and to improve it. As I recall there was little or no friction or disagreement within the group on any of the points. We were all focused on sustainability and environment and did our best to reflect this in the alterations to the then policy. This work resulted in a document noting changes on which we all agreed. As I understand , this document was sent to Adelaide for a committee to consider it. As I understand, also, it was rejected completely as it had too many amendments from the original policy. That is what I was told. Some time after this I was also told that at a large, possibly national Greens gathering or convention in Carlton, that when the issue of population came up, there were very loud intimidating aggressive voices raised to silence anyone who wanted to wade in on the topic. One of the people who had been part of the working group emailed the rest of us after attending this event, saying that he had no further wish to pursue this any further in view of the threatening tone of these people at the meeting. I never heard from this person again and the working group effectively dissolved at that point." Such censorship and bullying control by people dominating in a group reminds me of Arthur Miller's The Crucible, a play about witch trials in 17th century America. It is a play which has often been studied by high school students with the glaring lesson that free speech can be snuffed out by irrational alliances within the dominant doctrine. 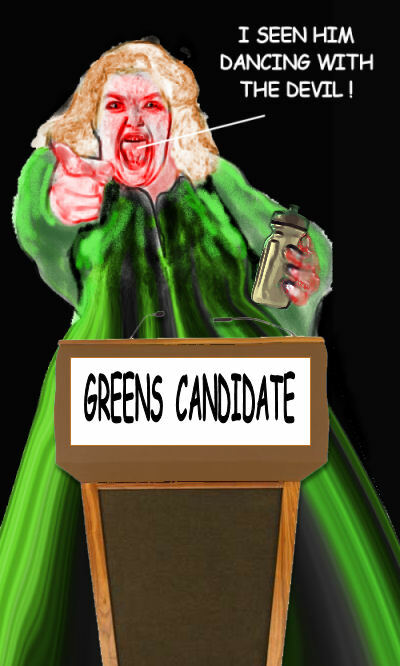 It sometimes seems as though the Greens are increasingly defined by people who have taken the role of Puritans accusing anyone they disagree with of witchcraft, except they accuse them of sexism and racism, where none exists. But the implications are similarly terrible, in that they are designed to stigmatise, ostracise, and disempower those they target, thereby silencing their views. In Miller’s Crucible the accusers were themselves guilty of playing at sorcery. They became fearful of being denounced themselves as sinners, and defend themselves by accusing others of attempting to bewitch them. If this is so then The Greens have gone down a blind alley and philosophically seem to have reached a dead end. What are they about if they cannot tackle the main threat to “green-ness”, environmental sustainability and conservation of nature and wildlife, which is human population numbers in situ? What are the elders in the Greens doing about the stifling of discussion within the ranks of the party? What do they think of the association between their members, so-called socialist groups and the violent Antifa, who are paid to riot? [No insult intended here to real socialists or anarchists.] They seem to be standing back or even approving while the intimidation grows. Are they in fact also the product of unexamined ideology? Do they agree with its effects, which are to keep Australian political debate confused and unrepresentative, bogged down in imagined racism and sexism (while real racism and sexism continue) and overpopulation and overdevelopment turn our environment into concrete. Are they all globalists? Do they really agree with massive, developed, urbanized import-export economies which destroy the diversity of hunter-gatherers, herders, tribes and nations for this? What can people who really are environmentalists do when the party that bears their flag provides cover for materialistic land-speculating nature-destroying neoliberalism for which population-dependent economic growth at all costs is God? 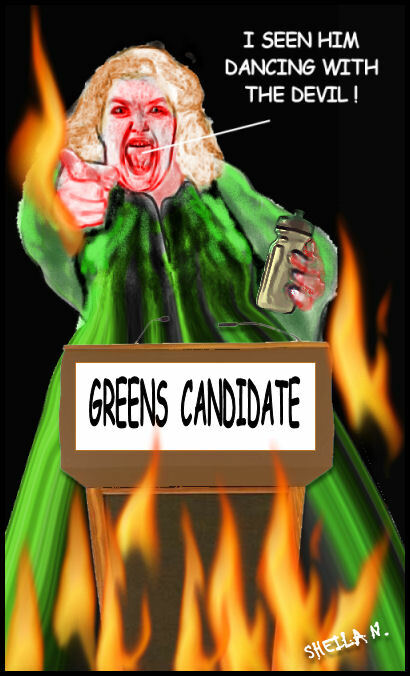 What can they do about the growing violence and intimidation in the Greens? Internationally: Wrong kind of green. the ostensibly humanitarian character of NGOs seems to justify itself. that we do to military interventions.."
Get Up: a new kind of wolf in sheep's clothing? Some of you may have received begging letters like the one below from GetUp. It invites you to go and declare your concerns to them, but, when you get there, GetUp only dictates a range of concerns which leave you with no possibility of mentioning population or immigration, wildlife or civil rights or anything outside the mainstream global paradigm, with the possible exception of climate change - although I would maintain that this is within the global paradigm; just contested. I met one of the Get up people in a satellite town of Melbourne when I went there to give a talk to an environmental organisation. This person admitted to me that Get Up is not interested in that subject and that they basically hire 'organisers' to shape politics in various regions, with the general effect of getting more people to vote for the ALP. The personal information and networking capability that GetUp derives from people telling them what they think about selected subjects is incredibly valuable for GetUp, but they give nothing back for it; presumably they also sell the information on and we who fall for their ploys, are more easily manipulated. "GetUp is the 21st century secular equivalent of the American radio and TV evangelists. It is an interesting new kind of wolf in sheep's clothing. Not a political party, with a manifesto and elected representatives, but a quick shape-changing parasite that has evolved to make a bit of spending money for a handful of clever opportunists who know how to exploit the new communication technology. Oh that such wickedness should be!" Not all that call themselves "green" are actually green! The environmental agenda of the Greens seems to have slipped under the radar and I wonder if this was the original intention of the Party, started under Bob Brown, or has it just been warped by the loony and extreme "Left"? They are becoming totally impotent and handcuffed to their own illogical agendas. It's more about human worship, or "rights", without limits than anything do to with sustainability. World with no borders, unlimited human powers, the unanimous acceptance of any ideology or cultures, and the contradictory support of Islam - a severe Right wing totalitarian cult! The latter contradictorily leaves few right for women, and total rejection of sexual diversity. They are increasingly exposing themselves to be inept, gagged by oxymorons and holding obscure Left objectives when challenged. They would like one generic world, devoid of sexes, culture, religion, and national identity. Any question of population growth- imposed by Capitalists - and family planning - exposes their real intent. Not the response I would have expected from Tamara. Enlightening. The reference to the Crucible was interesting - my first thought on hearing of someone being accused of racism for opposing uncontrolled non-humanitarian immigration was that it smacked of the old witch-hunts. I assumed that Tamara had supported Geoff’s comments because she struck me as idealistic but practical and humane when I spoke with her. I guess I should have reserved my judgement. Declare Hornsby Shire a zero population growth zone now - Geoff Dowsett, Hornsby resident since 1981. The Turnbull Govternment's abuse of our traditionally humanitarian immigration system involves right wing social engineering of city electorates to achieve Lieberal victory in every seat and to satisfy big business "donors" greed for infinite profit growth. It is a cynical attack on our Aussie culture - the traditional working class, our quality of life, our living standards our public infrastructure, our fragile fauna and flora, our community trees, green belt, our urban heritage houses - the Aussie back yard leading to increasing traffic pollution, chaos and congestion - sky rocketting house prices as population increases – constant disruption of our communities by constant sub division demolition of our heritage houses and gardens – constant construction and building disturbance of our neighbourhoods - increasing population density- loss of heritage gardens wild life and bio diversity - infrastructue melt down, rising prices as demand sky rockets - the list goes on and on. In other words unprecedented corporate welfare - achieved by importing record high numbers of non humanitarian "immigrants" - right wing, upper caste, aspirational, materialistic, conformists, happy to live in Mirvac and Lendlease's ugly monotonous McMansions in the western suburbs and Harry Trigaboof`s high rise battery hen tower block chook pens and eager to vote Lieberal while our rich socially diverse Australians are escaping this invasion of Sydney or suffering the foreign invasion inflicted on them - our poor - traditional working class, our artists, bohemians, old hippies, ferals, true Greenies forced out to create a polluted mono cultural fascist Sydney. Demand an end to Turnbull's destructive, corrupt immigration ponzi rort now - No more non-humanitarian so-called 'skilled immigration' and family reunions. Sustainable Population Australia Page shared a video of Q&A's program of December 11, 2017 [where Turnbull was asked the following question about the very high immigration]. "Could you explain why you are allowing approximately 200,000 people ( It`s actually more like 500,000 net pa ) to immigrate to this country every year & are there any plans to limit this intake or will it go on ad infinitem? What is the purpose of this massive intake which is well above other countries per capita?"